Determined that we must try My Greek Taverna, Buddha Boy left work early on the day of our wedding anniversary and picked me up from home. We got to the restaurant at about 4:30pm and had no problem obtaining a table. When we showed up, there were three other groups of diners. Thirty-minutes later, the restaurant was almost at its maximum capacity. Yes, this place is THAT popular. We shared two appetizers. 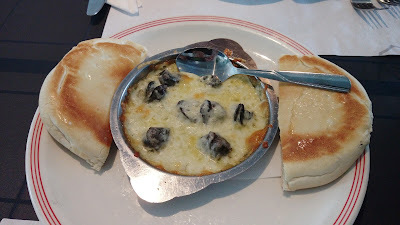 The first dish was Escargot. The snails were canned quality, of course. Not only this lacked that garlicky scent, it also lacked that buttery dip beneath the cheese for bread dipping. 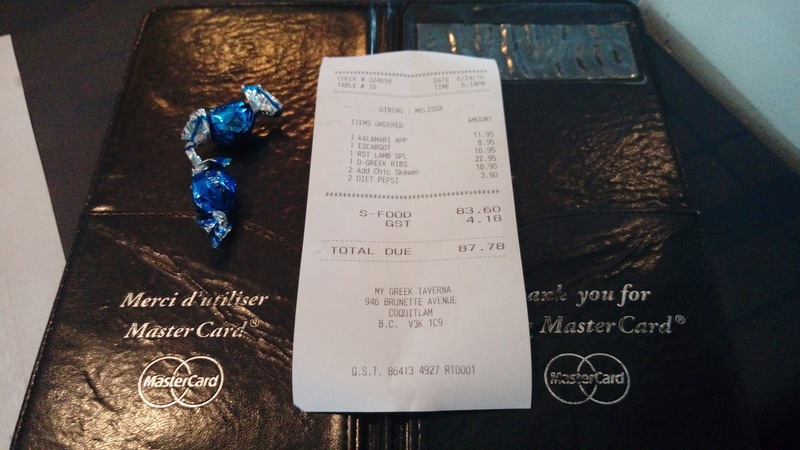 While the price was reasonable at $8.95CAD, it's not something we'd order again. Of course, a staple appetizer of Kalamari was a must. This was a large plate for $11.95CAD. The squid pieces were cut into optimal chunks and deep-fried to a delicate crisp. One miss was the lack of seasoning. After Buddha Boy sprinkled table salt all over, it's like a beauty makeover adding that fundamental savory enhancement to a dull and boring dish. 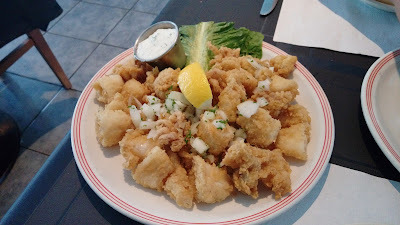 I enjoyed the creamy house-made tzatziki. Buddha Boy, on the other hand, didn't like the Greek yogurt richness. I love ribs, but I'm never a fan of smoked ribs or ribs smothered in barbecued sauce. 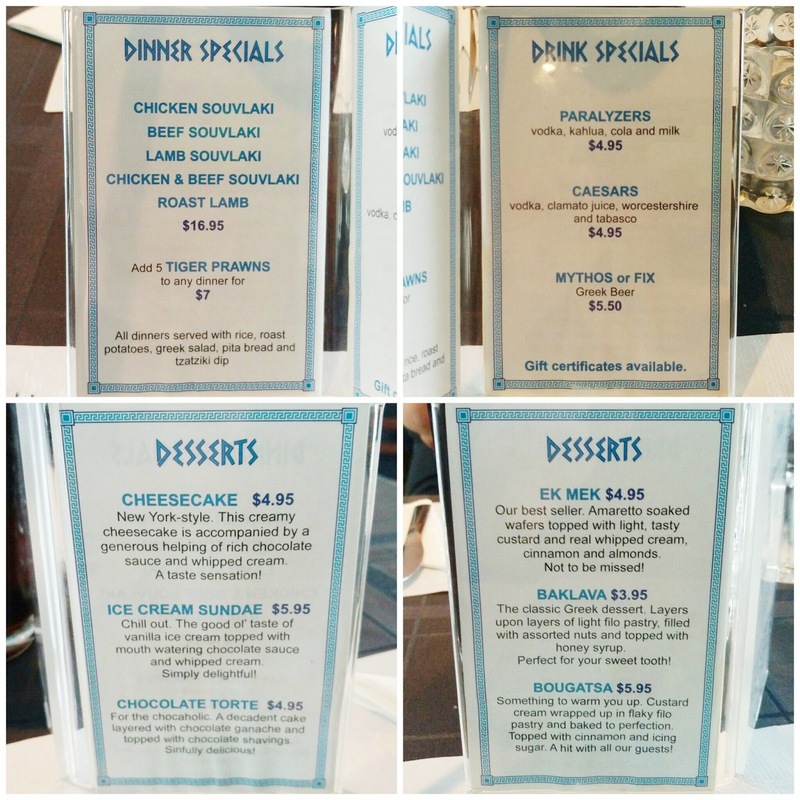 So when I saw the menu offering charbroiled ribs marinated with lemon and garlic, I knew that would be my main course. 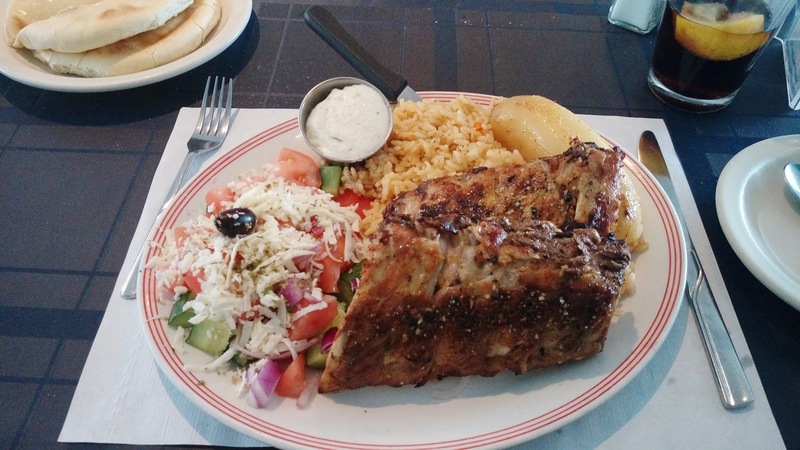 For $22.95CAD, the Greek Style Ribs was a considerable plate with a full rack of ribs. The rib meat did not have that easily-pull-off-the-bone texture but the meat was tender with a moderate tone of charred taste. The tangy lemon was quiet while the garlicky scent took a stronger presence. With a common seasoning blend of salt, oregano and olive oil, the accompanied Greek salad had a simple mix of cucumber, tomato, red onion, olive and feta cheese. Nothing to note on a typical roasted potato. Now, we're no expert in Greek cuisine nor do we have any clue of what's considered a sterling pilaf, but I truly love the pilaf here. The al-dente rice had that appealing chicken broth richness with a mellow and pleasing onion sweetness. I gobbled down all the rice on my plate! To my surprise, my never-a-fan-of-lamb husband ordered a Roast Lamb Special for dinner. This was a good deal for $16.95CAD as the plate had large portion of meat. The meat was tender but a bit on the bland side. Knowing that Buddha Dog loves lamb, Buddha Boy only consumed half of the protein just so he could pack some meat home for his furry son. Buddha Boy ended up eating all my lemon and garlic ribs. 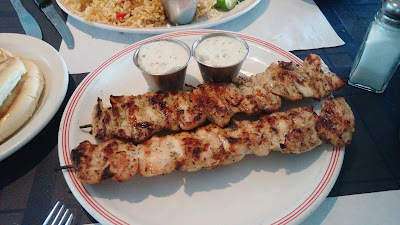 On top of our mains, we added two Chicken Skewers for $9.45CAD/each. These souvlakia had generous and chunky meats. The meat was tender but not moist. Each chunk of meat was nicely grilled with aromatic charred fragrance. This was worth the money. 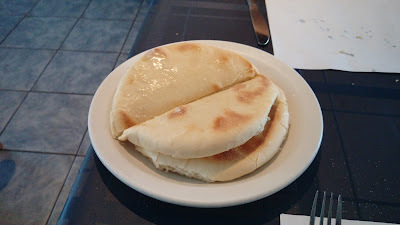 Our dinner dishes came with a Pita Bread each. Served warm and gently greased with olive oil, the bread was airy and soft. 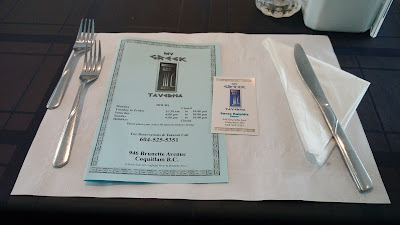 Our bill at My Greek Taverna came to a total of $87.78CAD, tax included. That's $31.87CAD more than what we paid at Stepho's Souvlaki Greek Taverna. 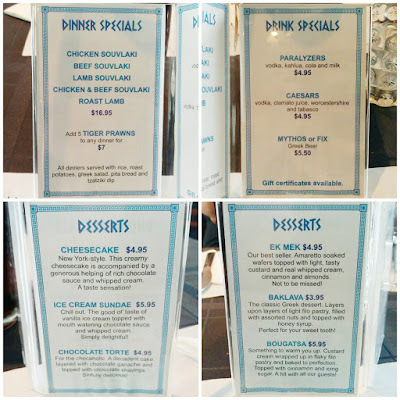 Which did we enjoy? 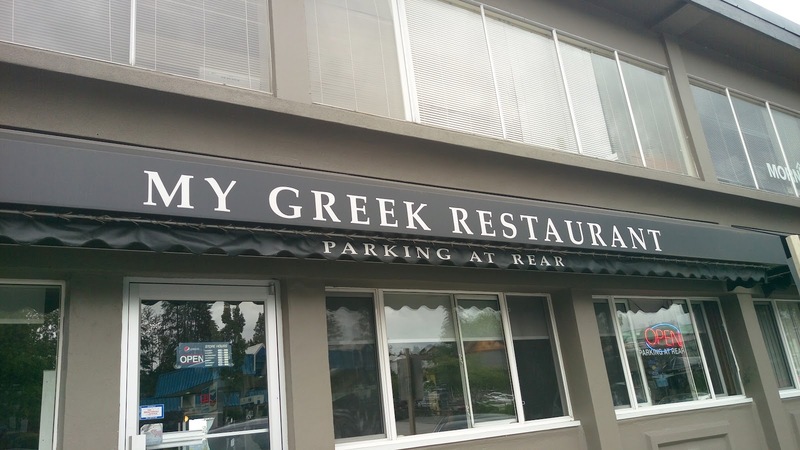 My Greek Taverna, of course. While the service was much, much, much more friendly and welcoming at My Greek Taverna than at Stepho's Souvlaki Greek Taverna, it was still a bit sparse and inattentive. We felt like walking into a factory where everything was expedited, rushed and hurried. Since Buddha Boy is diabetic, Greek food is not something we eat often. 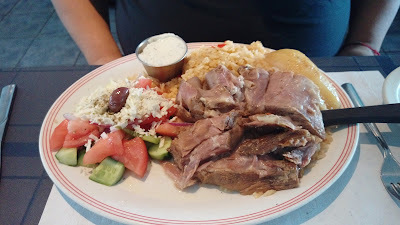 That being said, the big boy has already chosen his next Greek dine-out, Kisamos Taverna at Steveston Village in Richmond.